Prussian maritime town in the province of Hanover. It is not known when Jews first settled there. In the sixteenth century David Gans mentions ("Ẓemaḥ Dawid," 1581, ii.) Jews at Emden. In the letter of complaints (March 9, 1590) against Count Edzard I. and "the magistrate," addressed by the citizens of Emden to the imperial commissioners, who had come to Emden to settle the difficulties between the sovereign and his subjects, the citizens included as a grievance the fact that the Jews were permitted the public exercise of their religion, and that they wore no distinctive badge. The commissioners dismissed this complaint, and the Jews continued in the city as heretofore. Enno's son, Ulrich II., received Jews at his court; and once a Jewish couple was married by a rabbi in the presence of the whole court. This aroused the ire of a zealous Lutheran clergyman, Walther, who expressed himself as follows: "In the presence of 100 devils one pair of devils has been coupled by an elderly devil; people have no regard either for God or for myself." In the memoirs of Glückel of Hameln (1645-1719) mention is made of a rabbi of Frisia, of David Hanau, and of other Jews of Emden. In 1744 Emden, with East Friesland, became part of Prussia, and the Jews in these districts came under Prussian regulations. At that time the yearly sum paid for protection by the Jews of East Friesland amounted to 776 thalers; in Emden itself the regularly protected Jew had the right to bequeath this protection to one son, on payment of 80 thalers. On May 30, 1762, there was an uprising against the Jews of Emden, who were accused of having caused the depreciation of the coinage; and the magistrate did not succeed in dispersing the mobuntil the houses of four of the most wealthy Jews had been destroyed, though not sacked. After the peace of Tilsit, in 1807, Napoleon incorporated East Friesland with the kingdom of Holland, under his brother Louis Bonaparte, who freed the Jews from their restrictions and granted them (Feb. 23, 1808) the same rights and privileges as the Jews of France—that is, equal citizenship. Heavy payments for protection were no longer exacted. At that time there were about 1,364 Jews in the Emden arrondissement. Of that number there were not more than 500 in the city of Emden, and of these about 100 were in indigent circumstances. After the consistorial organization of the six new districts under the central consistory of Paris in 1811, Emden became the seat of the synagogue for the departmental localities of Oester-Ems (1,500 Jews), Wesermündungen (1,129), and Oberems (1,076). After the wars of liberation, Emden came under the dominion of the kings of Hanover, and the Jews were thrown back under former conditions, from which they were not liberated until 1842. Since 1866 Emden, with Hanover, has belonged to Prussia. The community of Emden numbered in 1902 about 900. Emden has been for centuries the home of famous rabbis. 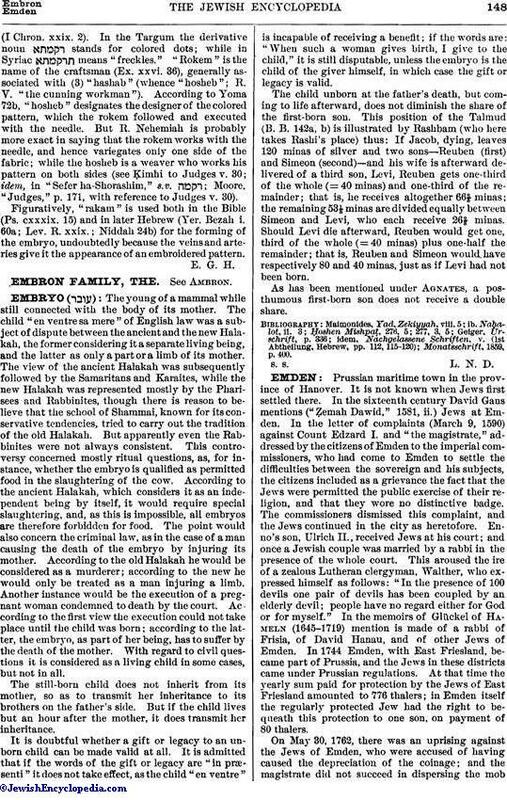 The following may be mentioned: Menahem b. Jacob ha-Kohen; Moses Simon b. Nathan ha-Kohen (d. 1668); Simon ha-Kohen (d. 1725); Jacob Emden; Abraham b. Jacob (d. 1758); Abraham Moses Kelmy ha-Levi; Baruch Köslin; Meïr Glogau b. Aaron (d. 1809); Abraham b. Aryeh Löb b. Ḥayyim Löwenstamm; Samson Raphael Hirsch (1841-47); Hermann Hamburger (d. 1870); P. Buchholz (d. 1892); Dr. Löb, district rabbi of Emden, in 1902. A magistrate of Emden is credited with granting, in 1649, privileges to Portuguese Jews, which were renewed in 1703, and in virtue of which they became full citizens. Among the Portuguese at Emden may be mentioned the physician Abraham German (1752), formerly living at Amsterdam; Isaac van der Hock (1753); Isaac de Lemos (1765); and Isaac Aletrino (1782). They were favorably received in the town, because, as the magistrate declared, "People of this kind are useful, and even indispensable, for carrying on the West-Indian trade." Four Jews of Emden are mentioned among those who attended the fair at Leipsic in 1690, and a larger number are mentioned in the responsa of Jacob Emden (Responsa, ii., Nos. 24 et seq.) 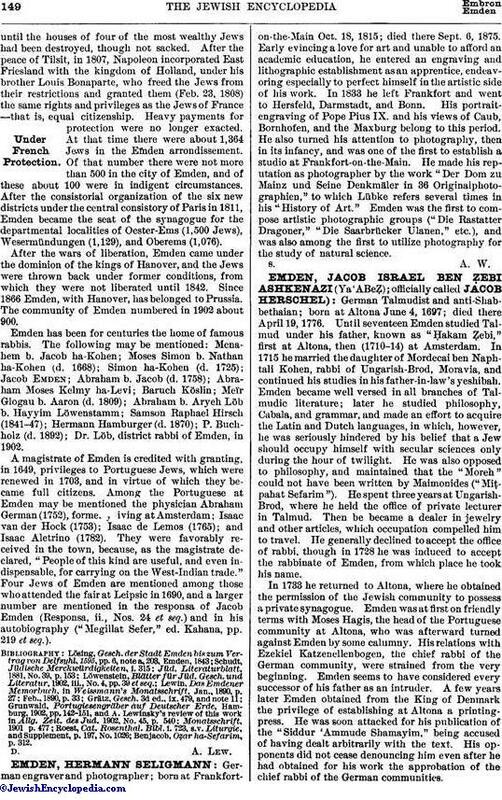 and in his autobiography ("Megillat Sefer," ed. Kahana, pp. 219 et seq.). Benjacob, Oẓar ha-Sefarim, p. 312.